The countdown is on until re:Invent 2018! This guide is designed to help public sector attendees plan their experience and identify breakout sessions and events of interest. It is intended to complement the re:Invent app, which will help attendees navigate the conference onsite. This year, we are offering activities like the Nonprofit Hackathon for Social Good, the Mars Rover “Insight” landing simulcast, and the AWS Public Sector Breakfast, as well as a set of sessions like Finding Tech Talent: Creating the Next Generation of Cloud Workers and Rapid Prototyping for Today’s Mission. 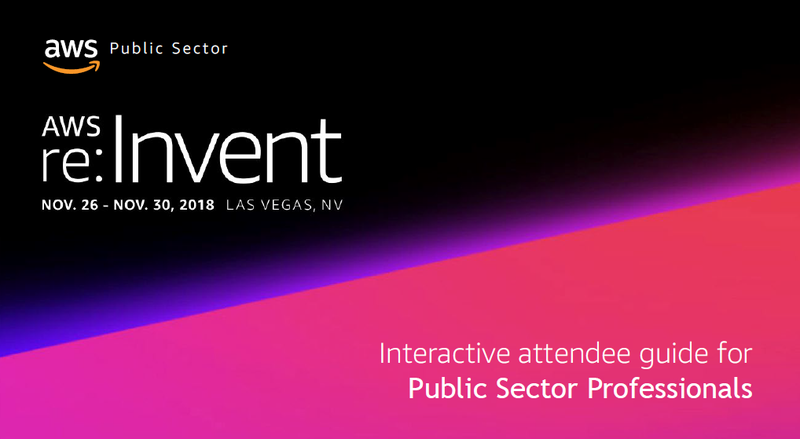 Although re:Invent is a big conference, the strength of the public sector community makes it a much more intimate experience. From networking activities to public sector-specific activities, use this guide to prepare for the big event. View the guide here.